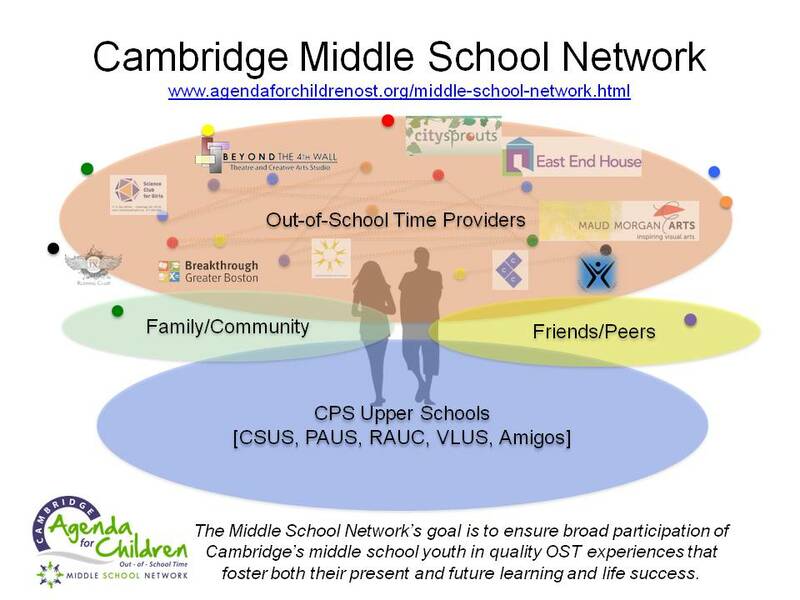 The Middle School Network was developed in 2009 in response to the Cambridge Mayor's Blue Ribbon Commission on Middle School Youth. The Commission found that only 1/3 of Cambridge youth were involved in any type of afterschool activity. In their report Shared Youth, Shared Strategies, the Commission recommended collaboration between existing organizations to ensure that all middle school students are involved in positive activities, programs and experiences in the hours after school ends. Today, the Network serves as a forum to help Cambridge schools and organizations best serve this unique age range. The Middle School Network holds regular meetings during the school year to advance coordination, collaboration, and shared goals and actions among providers. The goal of these meetings is to work together to increase participation, equity and access to programs, and achieve positive outcomes in OST for youth in grades 6-8. All middle school-serving entities and personnel in Cambridge are invited to participate. ﻿​​Contact Annie Leavitt﻿​​ for more information. MSN convenes monthly meetings among providers serving middle school youth to coordinate, collaborate and take action in our programs and as a network. To see the dates of this year's MSN meetings, visit the Events Calendar. MSN publishes three ﻿Resource Guides﻿ each year (Fall, Winter/Spring, Summer) to compile all OST opportunities available to Cambridge 6th-8th graders, in addition to other organizational tools for helping young people get connected. MSN supports and supervises staff at each Cambridge Upper School who are focused on supporting individual young people as they navigate barriers to engagement outside of school . Every March, MSN coordinates Summer Opportunities planning workshops, facilitated by OST providers, in all classrooms in Cambridge Public Schools, to help 6th-8th graders build awareness about their options and plan for their summers.